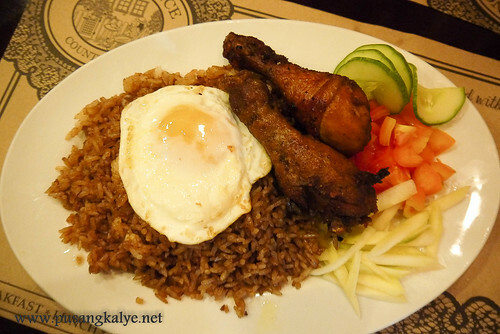 WHITE FENCE COUNTRY CAFE: Nasi Goreng, Honey Glazed Chili Wings, Smokey Backyard Burger and more! Our accommodation in our latest PPS trip Palo Alto has a decent restaurant but they will not feel bad if you want to try other food finds downtown. As a matter of fact, Palo Alto even provides free shuttle drop off and pick up. Van leaves for town 6:00 pm and pick up is 9:00pm. If you already have a restaurant in mind, they will even drop you directly there. In our case, we picked one with an intimate setting. 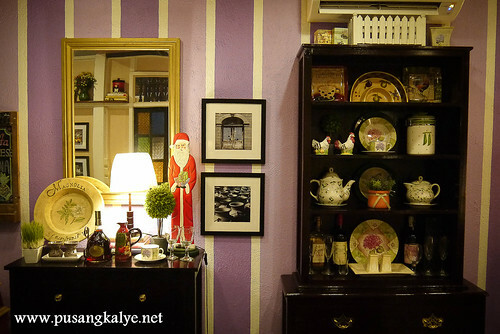 Something of class but with good food that is not too heavy on the pocket ---White Fence Country Cafe. 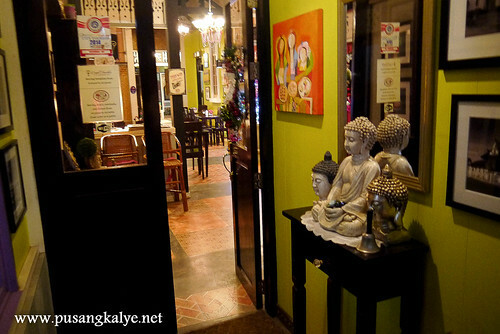 The restaurant is part of Purple Fountain Courtyard Inn but is open to public and it is pretty famous for walk in guests. It consistent with the lovely appeal of the Inn. 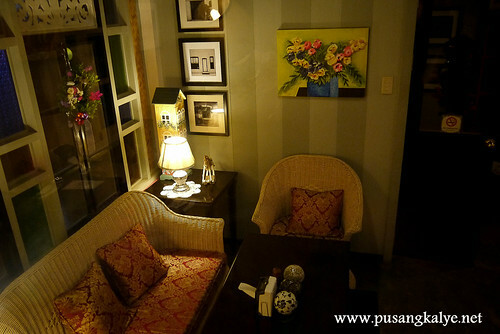 It's cozy and intimate especially at night, thanks to the artsy interior. 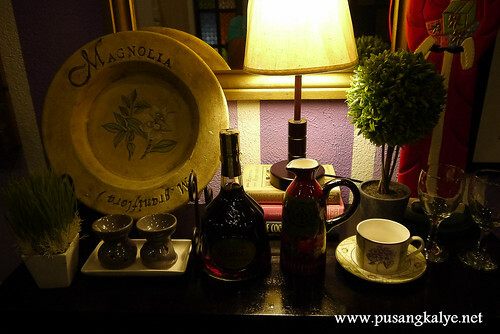 Tastefully interiored as tasty as the food they serve. I know homey is an overused word in food and hotel reviews but no better word describes the mood at White Fence Cafe. 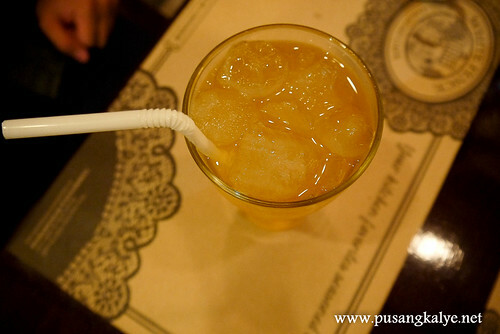 You will instantly feel comfortable with the place and you will hardly feel the wait for your orders as your eyes will be feasting on the details inside. 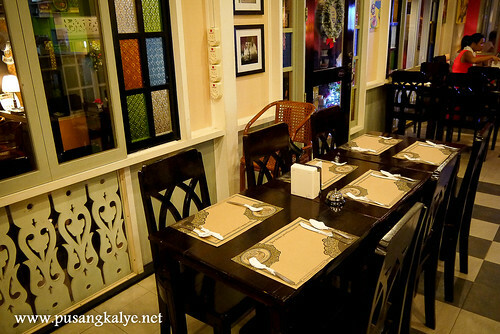 This is a medium-sized restaurant which could be divided into two sections. The first upon entry is the al-fresco (sort of) section but the temperature here is surprisingly cool because of the good flow of air leading to the Inn and the wooden materials prevalent in the restaurant. 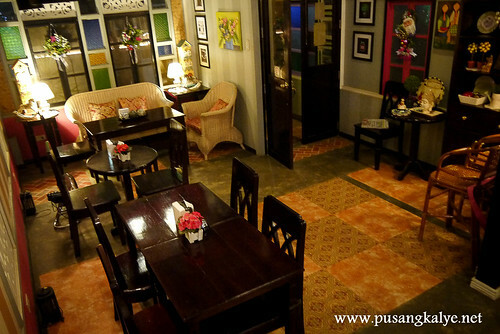 For a more intimate and cooler venue, there is an airconditioned section too and that is where we decided to have dinner. WARNING: The place could be "intimidating". 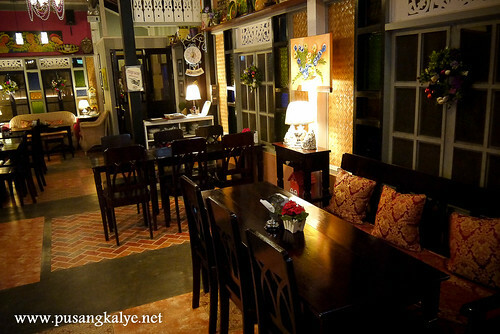 With a restaurant this beautiful, one might easily jump into conclusion that it is expensive. Actually not. I actually expected it to be expensive but not as pricey as I thought. Actually, the prices are very reasonable with the quality and size of serving. I am sure it will be within your budget. I will be willing to pay a little more for this kind of ambiance. At White Fence Cafe, you get more than what you pay for. Try their version of Nasi Goreng, Honey Glazed Chili Wings (my favorite), Smokey Backyard Burger, Tomato Basil Parmesan and Carrot Cake among others. Yum, Yum, Yum! If you look at the menu, there are so many recommended house specialties. There were only the two of us though so we got to try just a handful. Not so much like the nasi goreng I tried in Malaysia but this is a different twist. 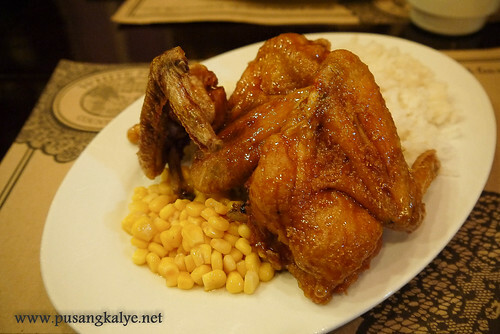 The rice is nice but since the chicken is fried and with no sauce the whole is basically dry. Make sure you eat this with a nice drink nearby. The chicken is the star of this dish as it is flavorful. If you have kids with you I am sure they will feast on the chicken and perhaps leave the rest behind. This is a house bestseller. Another house specialty, this is by far my favorite. Sweet, spicy, saucy and still crispy. Splendid indeed. I looooove the sweet-spicy kick of the sauce and they provide extra of this sauce p so I really enjoyed it. Sarap to the bones talaga. Plain rice? No problem! 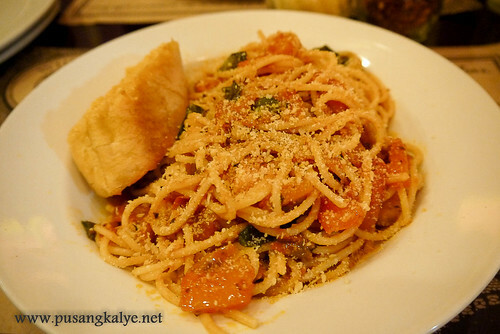 Authentic-tasting Italian Spaghetti. The spices are really dominant and I enjoyed its non-greasy taste. Thanks to the olive oil. Big serving so me and companion took the time to finish it especially because we tried it after the nasi goreng and honey glazed chicken. 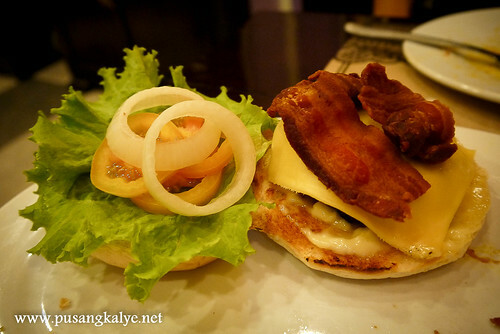 I like this burger. A lot! Smokey, yes. That gives the burger a lot of flavor. 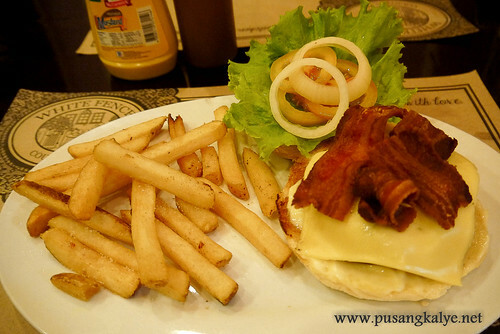 The bacon is crisp and tasty and the mayo gives it a flavorful blent. Another favorite for me! 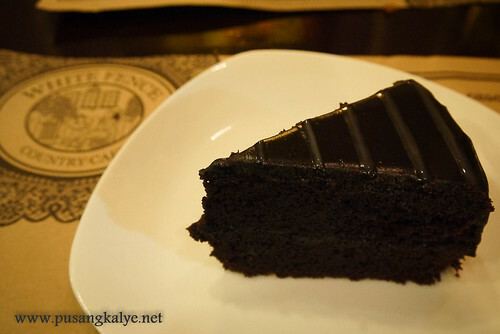 This cake is nice but I am soooooo tired chocolate cakes so I find it just ok. Nothing to wow for. 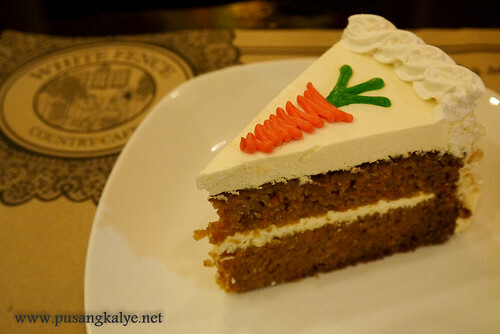 We only thought to give it a try for reference to the carrot cake which we love. Not bad at all though. A welcome alternative to the usual cakes you find. Not too sweet but enough to excite you sweet buds. Creamy icing. What a good way to end a very satisfying dinner at White Fence Cafe. which flies 4x daily to the city.